Zynga is planning on releasing its fifth casino game on Facebook called “Zynga Elite Slots”, which is what the company calls its “first synchronous, multiplayer slots game.” Players can enjoy casino slots while also being entertained through storybook animation where you advance through several “themes’ and level up your characters. With other popular titles like “Zynga Poker”, “Zynga Slingo”, “Zynga Slots for Mobile”, and “Zynga Bingo”, the company set out to give an experience where players collaborate with up to 150 people in a virtual slot room to beat the game. But what’s different from normal gameplay is that, instead of advancing in the game using a game controller or a click of a mouse, players need to win at slots. All the standard rules of a slot machine that one might find in Las Vegas apply here and as a player wins, so does everyone else — basically it’s a “win-win” situation for everyone. “Zynga Elite Slots” was created out of the company’s Austin office, the same one that laid off more than 100 people two months ago. It’s timing coincides well with news earlier this month that the social gaming company has asked the Nevada Gaming Control Board for a decision concerning its application to enter “real-money gambling”. Outside the US, it already has a deal in place in the United Kingdom, via its bwin partnership, to release online casino games starting in 2013. With what Zynga is calling “true social engagement among players”, people can log in to play anytime they want and find others to play with. They select a pet as their avatar and go on “quests” to beat a boss. Players progress by playing the slots and there’s a progress bar on the screen that shows where you’re at in the game — although it is tuned to the slot room you’re in, not your individual progress. Like with video slots, players can choose how many lines you wish to play with in order to increase their odds at winning, but be warned: the more lines, the higher the bet. 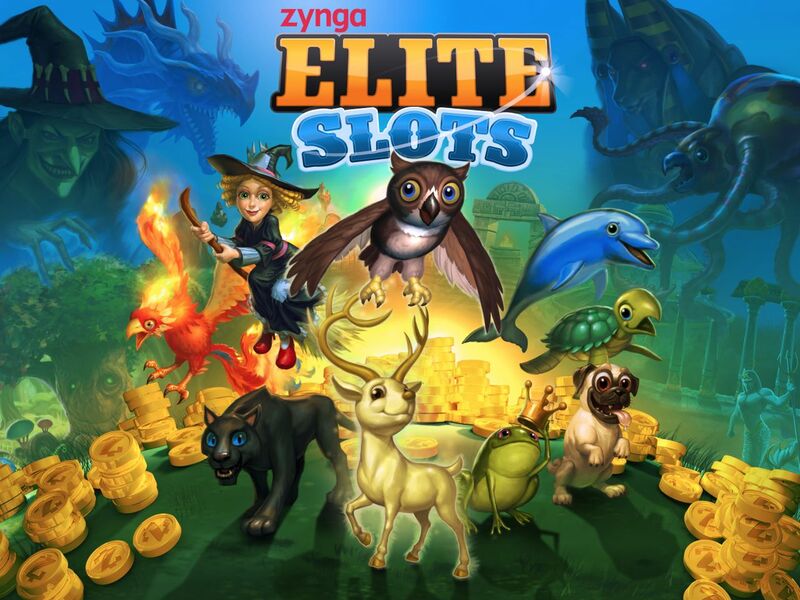 As stated earlier, “Zynga Elite Slots” is a win-win game for all so when others in the room win as well, players will notice other pets racing across the screen when other players win and share their loot. Each win provides tokens, gems, and other items that can be collected — although you don’t get them right away, you need to play slots in order to “move” your character to gather them. Players choose a pet for one round or one theme, but aren’t required to stick with it all the time. In fact, there are 26 different pets in the game, although in the beginning, only five are available. Pets can be swapped out in a game at any time. Each one has their own attribute and the longer you use that pet, the more it matures and grows in skills. Items collected throughout the game can be collected and eventually redeemed for bonuses. There are mini-games within “Zynga Elite Slots” that allow you to earn more tokens in order to play more. Tokens can be accrued on a time-basis or through a variety of ways. Sure, you can leave the game on and walk away for days in order to see your daily influx of tokens increase, but that takes too long. Zynga says that through its traditional social ways, players can increase their daily token allowance — through inviting friends to play, as people for free spins, and others. At the end of each round, there’s a boss that players must “fight” by winning at the slot machine. By beating the boss, more prizes will be unlocked, including legendary pets. A leaderboard is also present throughout the game where players can compete against each other. Zynga says they’ve spent a great deal of time working on making “Zynga Elite Slots” unique — there are six themes for players to participate in, each with their own voice-overs, graphics, and 50-60 minutes of original musical scores. The company says that it spent an incredible amount of detail making sure everything is perfect. “Zynga Elite Slots” is the first game since the company announced in a public filing that it was seeking to separate itself from Facebook. It will be launching first on Facebook.com soon, but it could be likely that it gets extended to other networks or devices in the future.